Postcard US-2233438 from Ohio shows a pair of Amish children going to school with their lunch boxes. According to the Amish News, "these children’s days are not given shape by a line-up of soccer games, piano lessons, camp, or play groups. Instead, the morning sun, chore-time twice a day, and the coming of evening set a structure for their time. So, too, do the days of the week and the seasons. In this largely rural, soil-anchored world, life follows the lead of the weather and the promise of productive fields and gardens." 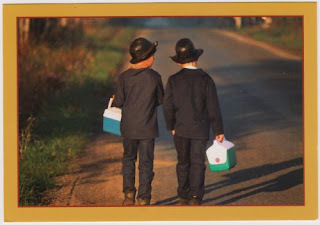 Since the birth rate is considerably higher than the death rate, the Amish population has actually been growing over the past several centuries.